I didn't want to go to printmaking tonight. I wanted to lie on the sofa and watch Masterchef and drink wine. In the end I did go, because I didn't want to give in to lethargy and laziness. We were doing linocuts, and I had to fight my dislike of that, too - memories from school, of hacking away at slabs of lino with no finesse and gouging chunks out of my fingers. 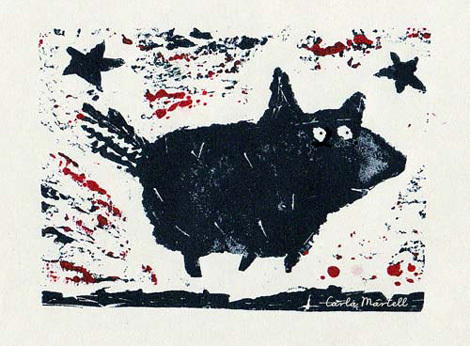 Of course it all ended happily (as these things often do) and I made a little dog print, though there was some debate as to whether it was really a pig. Whatever it is, it's something with three legs, as my rough and slightly manic hacking chopped off one of its legs and half an ear.